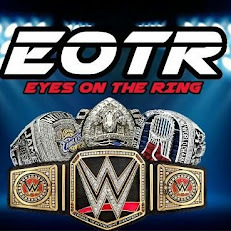 Nathan (@Headliner5 on twitter) here, you know me from my weekly Ring Of Honor TV reviews right here on eyesonthering.blogspot.com, but since ROH TV hasn’t been new in a few weeks, I figured I would do something different this week. Plus it's in effort to keep myself relevant within the site so I figured I'd provide you with the latest edition of our “All Eyes On…” profile with a look at ROH’s very own Tommaso Ciampa. Tommaso Ciampa was trained by Killer Kowalski and made his debut in January of 2005, making his mark in Chaotic Wrestling, located in Lowell Massachusetts, under the name Thomas Penmanship. He would stay with CW until 2007, where he then would make his World Wrestling Entertainment debut on the July 14, 2005 episode of Smackdown as Thomas Whitney, ESQ. as one of Muhammed Hassan’s lawyers. He would confront the Undertaker, which Ciampa claims is one of his favorite moments of his career, where he read a prepared statement from Hassan before being attacked by The Undertaker. On the August 25, 2006 episode of WWE Heat he would team with Kofi Kingston in a dark match against Lance Cade and Trevor Murdoch. On February 4, 2007 it was announced that Thomas Whitney (Ciampa’s real name) signed a developmental contract with WWE and was sent to Ohio Valley Wrestling. He would make his debut on February 21st and wrestled as Tommaso, but after suffering an injury, Ciampa was forced to step away from the ring and take on the role of an Anger Management Specialist known by the name Dr. Thomas. On August 9, 2007 Whitney was released from his WWE developmental contract. After his release from WWE, Ciampa would make his return to the independent circuit in late 2007. He worked with Harley Race’s World League Wrestling. He has also worked for MWF the Maryland Wrestling Federation, where on September 29th of that year, Ciampa would win the MWF Television Championship defeating both AJ Styles and Eddie Edwards in a triple threat match. In 2011, Ciampa would return to a major promotion with Ring Of Honor Wrestling, making his debut in January of that year. On the January 22 tapings he defeated Mike Sydal (Matt Sydal/Evan Bourne’s brother). He then joined Prince Nana in Nana’s heel stable known as the Embassy. On July 13, 2011 it was announced that Ciampa had officially signed a contract with Ring Of Honor. He would make his debut pinning Homicide at Death Before Dishonor IX on September 17 of 2011 in a tag team match. Ciampa was teamed with Rhino while Homicide teamed with Jay Lethal. Ciampa would defeat then ROH World Television Champion Jay Lethal in a proving ground match to earn a future opportunity at said title. On March 4 at the 10th anniversary show, Ciampa would receive his match but it would end in a fifteen-minute time limit draw. Ciampa would continue to feud with Jay Lethal throughout the year. On April 7, Ciampa defeated Lethal, Adam Cole, and Mike Bennett in a four way final to win the 2012 March Mayhem tournament. On May 12 at Border Wars Ciampa’s undefeated streak was ended by Lethal in a singles match. Ciampa would receive another World Television Championship opportunity against both Lethal and Roderick Strong. Ciampa would come up short yet again as Roderick would win the match. After this match (and Prince Nana’s interference) Ciampa turned on Nana after it was revealed that Nana had made a deal with Truth Martini to keep the Television Championship on then champion Roderick Strong. The feud between Lethal and Ciampa would reach its conclusion on August 11 at ROH’s Boiling Point in a two out of three falls match. Five seconds into the match Ciampa would tear his Anterior Cruciate Ligament but he would wrestle the remainder of the match in a losing effort. After missing ten month’s of action, Ciampa would return from injury at Border Wars 2013 on May 4 chasing former manager RD Evans and his new associate Q.T. Marshall. On August 3, 2013 Ciampa entered a tournament to determine a new ROH World Champion after the title was vacated due to a kayfabe injury by then champion Jay Lethal. Ciampa would defeat Bennett to advance to the semifinals of the tournament but would lose the semifinal match and be eliminated from the tournament by Adam Cole in a great showing even in a losing effort. At Final Battle 2013 On December 14, Ciampa began his first and only reign (at least to date) as the ROH World Television Champion when he would defeat former champion Matt Taven for the title. At Supercard Of Honor VIII Ciampa would lose the title to Jay Lethal following outside interference from Truth Martini. Ciampa’s TV Title reign lasted four month’s. After being gone due to an extended absence, Ciampa would make his return to ROH on July 19th with a new look having gotten noticeably bigger in size and with a full beard. He then defeated Adam Page of the Decade and followed it up with a promo where he demanded a ROH World Title shot from the ROH brass but he was interrupted by Silas Young. He lost to Rocky Romero on August 9th by losing via disqualification after he failed to release the Sicilian Stretch at the referee’s five count. He would then go on to unsuccessfully challenge the man who at the time was the ROH World Champion in Michael Elgin. On August 23, 2014, Ciampa was suspended indefinitely in kayfabe terms from ROH for attacking the ring crew and Bobby Cruise (the ROH Ring Announcer) thus completing his heel turn. There you have it readers, everything you need to know or ever wanted to know about current Ring Of Honor Wrestler Tommaso Ciampa. I am happy I was able to provide this entry in the “All Eyes On” series as Ciampa is one of my favorite wrestlers currently. What will the future hold for this talented wrestler? Keep your eyes on Tommaso Ciampa to find out the answers.